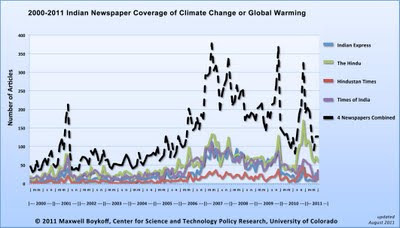 The news is out – climate change reporting in the media has increased in the past couple of years. A continuing media monitoring study by the Center for Science and Technology Policy Research (CSTPR) of the University of Colorado, Boulder, USA, has posted the trends on their website. I saw it first on Mike Shanahan’s blog on the environment. The CSTPR has produced graphs for global trends (2004-2011) and also for India (2000-2011), Japan (2005-2011), UK (2000-2011) and USA (2000-2011). In the global graph, the curves for the continents look similar. Climate change reporting across the world has increased since the middle of 2006. The tallest spike in all the graphs is around end-2009, which correlates to an increase in reporting everywhere closer to the Fifteenth Conference of Parties (COP-15) to the United Nations Framework Convention on Climate Change (UNFCCC) held at Copenhagen, Denmark, in December 2009. There are a few smaller spikes after 2009. 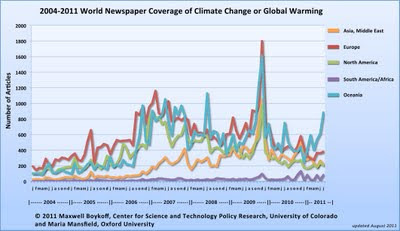 For the global study, Boykoff and Mansfield looked at climate change coverage in 50 newspapers. They used the keywords "climate change or global warming" over multiple search engines to get the number of stories. Interestingly, after the spike related to the Copenhagen COP, there is a decline in climate change stories in North America and Europe. Newspapers in Oceania show consistent interest in the subject. In fact, since February the number of news reports have been steadily rising from Oceania. Maybe the flood in the eastern part of the continent and the drought in the western part is contributing to the interest in the subject. Though showing a decline in the recent months, Asia and Middle East have been keeping pace with coverage in Europe and North America in the past two years. The study records very few stories on climate change from Africa and South America. For the Indian study, Boykoff has looked at four newspapers - Indian Express, the Hindu, Hindustan Times and the Times of India. The Hindu has had the highest coverage, followed by the Indian Express and Times of India. The Indian newspapers have had a peak corresponding to the Copenhagen COP. This is in keeping with the world trend. There are a few other peaks in the Indian graph. I wrote to Dr Boykoff to confirm what was the reported during the other spikes in the Indian graph. They relate to the coverage around annual COPs. Overall, the trend for India is clear. 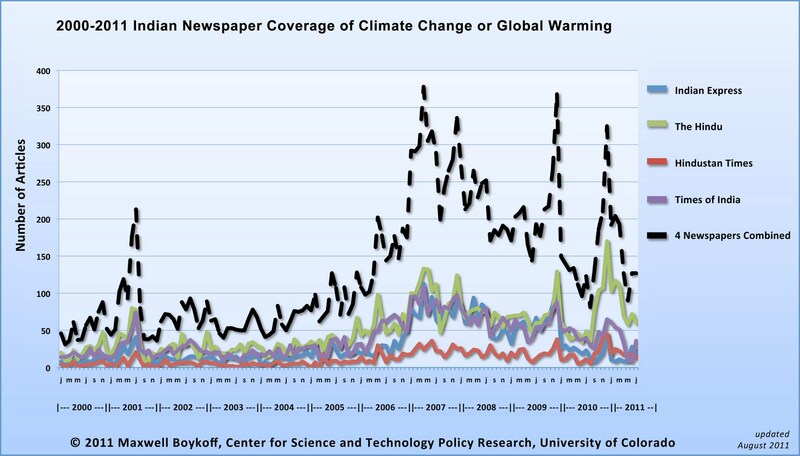 There are far more climate change stories in Indian newspapers since end-2005 when compared to the years 2000 to 2005. The Indian graph caught my attention since it gave empirical evidence to a conversation I had with my environment journalist friend in India a few weeks ago. My friend and I go a long way. We both started writing on environment and development more or less at the same time - in the late 1980s-early 1990s. In 2001, both of us were invited to Helsinki to interview the Finnish Environment Minister, Ms Satu Hassi, before her maiden visit to India. He was representing the Indian Express and I the Hindu Business Line newspaper. A few weeks ago, I was discussing with my friend the present environmental reporting situation in the Indian media. I have been away from the country for two years and needed to know the situation from him. He said that there has been an increased reporting on environment in India, and especially so on climate change. The CSTPR graph for India confirmed what he said. The trend is not surprising for somebody who has followed climate change negotiations since the 1990s. India was not listed among the countries that had to reduce their greenhouse gas emissions by the end of the first reporting period of 2008-2012. Even in the 1990s it could be foreseen that India would be under pressure to make binding commitments on making emission reductions in the second phase. This background went into all the discussions on emissions trading after the Kyoto Protocol of 1997. The sustained growth of the Indian economy in the past decade has ensured that the pressure to make India join has been getting stronger in every annual COP. In the buildup to each COP, since the one held at Nairobi, Kenya, in November 2006, there have been international stories mentioning about Indian emissions in relation to the global picture. These cues have been picked up by Indian media and there are many stories on Indian policy position before, during and immediately after the COPs. The spikes on the Indian graph are not coincidental. In Indian media the dividing line is not between Western stories and Indian stories. The Indian media generates its own stories, and even when a story from the West is used it is contextualized for India. The dividing line is between the macro policy stories and the local stories on environment which do not link to the larger climate change picture. Many of the local stories which have a link to climate change will not get counted in a study such as the one being done by CSTPR because they do not use the keywords (climate change or global warming) in them. Most of the stories on industrial pollution, forest rights, iron ore mining, wind energy and solar energy may not get reflected. All stories do not need to make a mention about climate change. But if they do then they will help building the concept of climate change among the readers. The issue of climate change and global warming are still vague for the uninitiated. That is still because the reader cannot link between the developments that he experiences in his day-to-day life to something related to a warming world and discussions that experts have in international meetings. And herein lies the catch in the entire climate change narrative - the missing middle link. There are stories on global meetings and policies and there are local stories. How the macro links the micro and vice versa is mostly lost in the reporting. This, however, is not a gap with the reporting alone. Scientists themselves shy away from making the connection. Maybe the science on climate change is still evolving and it is not possible to make definitive statements. At least in the recent years, journalists, scientists and policy makers have tried to talk about the linkage with climate change during major extreme weather events. In August 2010, for instance, there were two important stories that had caught global attention - floods in Pakistan and fires in Russia. The events were heavily reported.There were a few caveat-ridden hints to climate change in some stories and when interviewed scientists did make some indirect references. Nearly 20 years after the UNFCCC came into being, people do talk about climate change. However, it is still a distant concept, which does not link to day-to-day realities. It will become tangible and palpable only when it reflects in local stories.